I took a step away from some dressmaking this week to sew up a nice, easy summer top. I thought I needed something casual and cool and non-knit. I wanted to use a set of charming IKEA pillowcases that I picked up while thrifting -- I loved the spotty green print! These pillowcase were sewn together with the fold at the end, not the side, though, so when I deconstructed them, I was left with two long strips of narrow fabric. Hmmm, what to do? 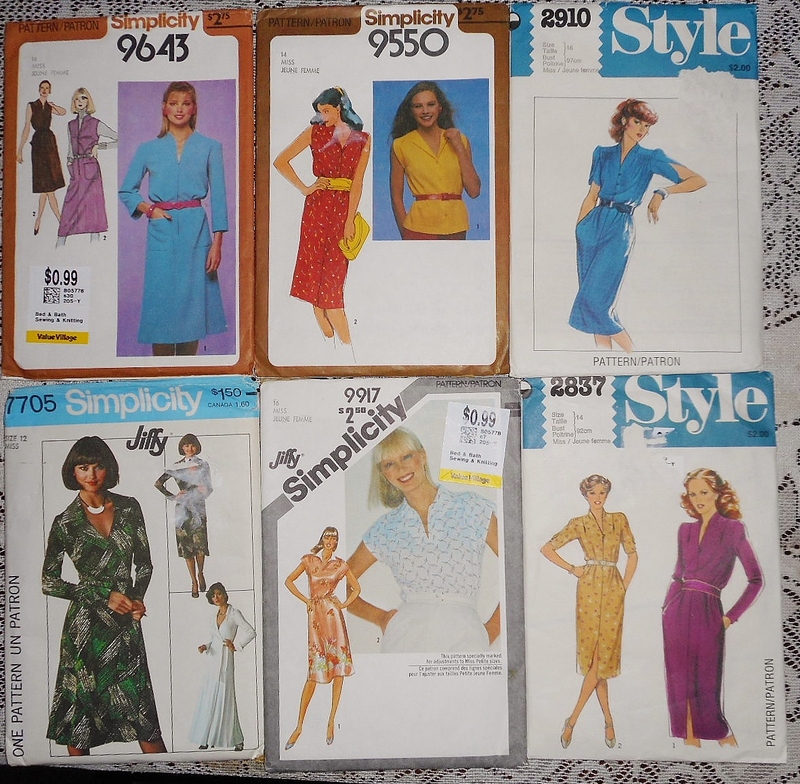 I searched through my pattern stash, and decided on Simplicity 1280 . I bought this pattern originally for the crossover blousy view, but when I looked closely, View E had a centre front and centre back seam, with easy cut-on sleeves. Perfect! I laid out all 2 pieces on the fabric and saw that it would fit with some tiny adjustments to the sleeve length. 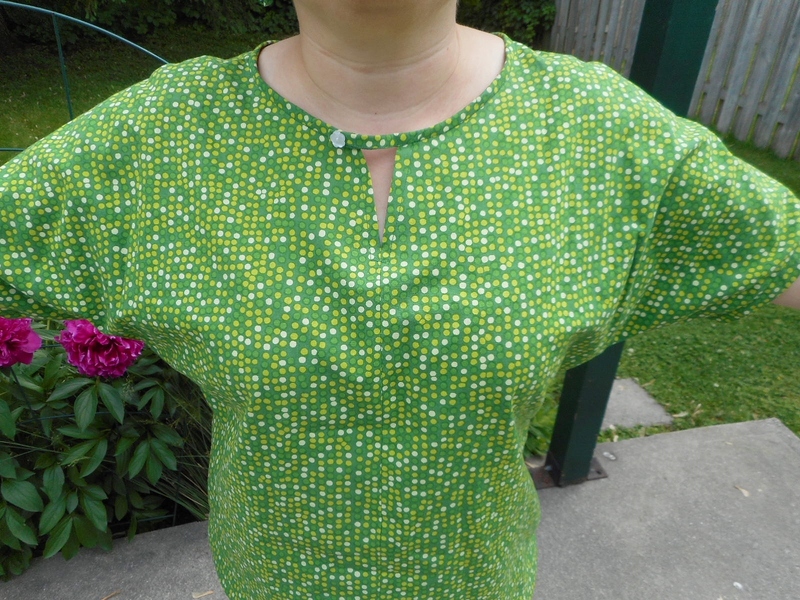 Which was perfect since I had to both shorten the sleeve to make it more proportional to my short arms anyhow, and take a half-inch out of both centre front and back (on the pattern piece -- grading from the neckline down to nothing at the bust line. 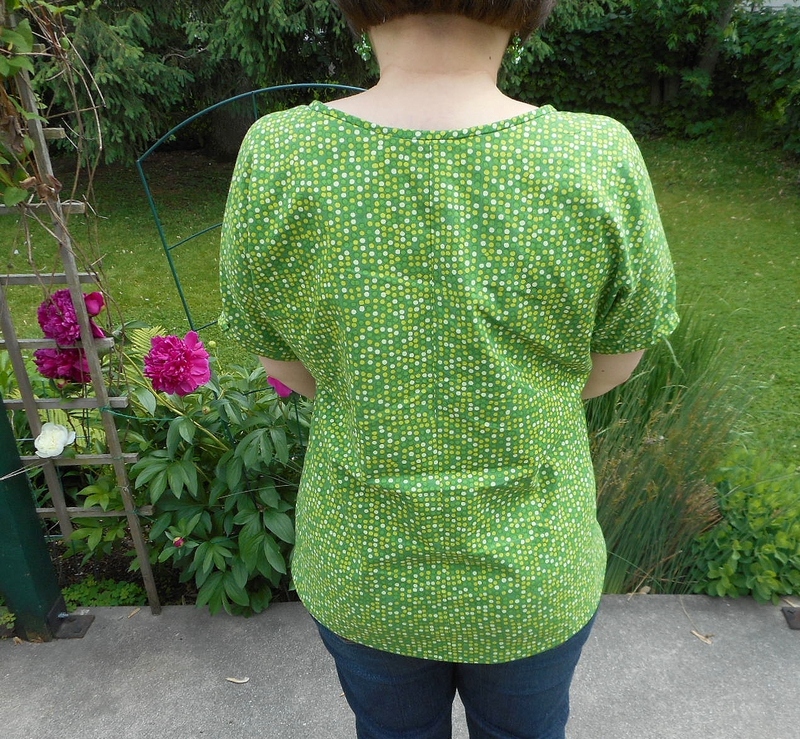 I needed to take in an inch in total) I cut a Medium, but after all my alterations I did wonder if I just should have cut a small to begin with and just grade out to medium at the hip! excuse the creasing, it was at the end of the day! The only other catch was that I didn't have enough fabric to cut a bias strip to bind the neckline. I really did want to use the same fabric for the binding, especially to cross the v-neck opening, as I thought it would look better than a contrast fabric. So I carefully cut some bias binding out of the narrow 4" strip remaining at the bottom of the fabric after I cut the front piece out. I should have taken a picture of the wild twistiness of the fabric tube when it was all pinned together -- warning, try not to use long and narrow pieces of fabric to make bias binding, it gets a bit crazy! But it did work out and from just one piece of the four strips left over, I had plenty of binding to finish off the neck. That was the only other "oops", actually. I forgot that I'd taken out an inch in the front and back and merrily sewed away, not realizing that the V opening at the front allowed me to expand and find room to stitch it all on...but when I tried it on and the V was sitting at its natural width, I had a big "U" of binding poking out in the opening. Ah ha, there's the missing 2 inches! For a second I despaired, thinking I'd have to pick off all the binding and redo it...so much for my easy sew. But then I decided to just fold down the excess to one side and hold it by stitching a button through all layers. I think it looks like the binding is supposed to button on one side of the neck opening now. The only other thing I had to fix was just to take it in 1/2 " on each underarm & side seam. 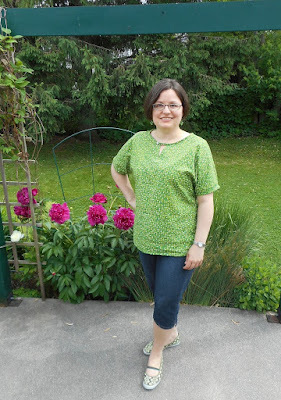 When I first wore it, it felt like I was wearing scrubs because it was so boxy; my own fault as I made it from cotton instead of the drapier fabric suggested in the pattern. So I took it in slightly to give it more shaping, and then folded up my finished sleeve hems and stitched them down again to shorten the sleeves a little more. I think that removed the feeling of scrubs. It is an extremely light and airy top, that fits nicely and is really cool on a warm day. I am very pleased with it. I wore it today to do some farmer's marketing and stop in at a thrift store as well, and while it creased a little from sitting, it was otherwise a perfect wear. And just look what I discovered at the thrift store! Well done you've done wonders with the pillowcases. The colour is lovely on you. The button solution looks like it was always meant to be. I love to set myself a challenge when I find unusual sources of fabric ;) I'm so glad you think the button looks like it fits in! I think this is such a lovely top. Tracy is right that the green does suit you. Thank you! I do like the bright feel of this fabric. What a very pretty top for the weekend - great job solving all the problems you had, and a wonderful new look for two pillowcases. This is a great way to learn to sew well (buying op shop fabric) - not too expensive and you have a nice wardrobe as well. Thanks, Sarah Liz -- it is fun to use reclaimed fabrics -- I'm not as afraid to chop into them :) Plus I feel like I am putting them to some use before they hit a landfill.